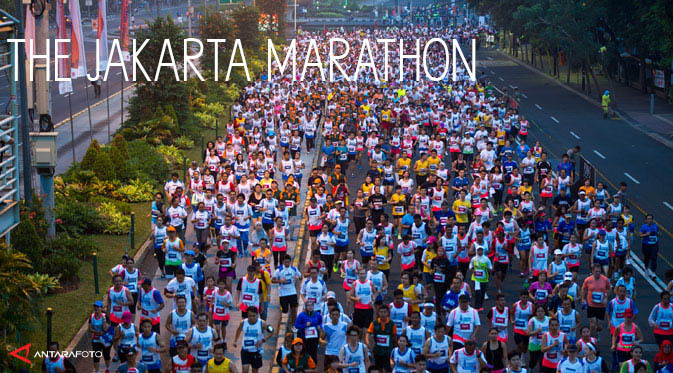 Going to a race is like having a holiday – a holiday not based on religion or nationality, but where people come together for community and celebration in athletic ability. Everyone is excited for the same thing: crossing the finish line. Everyone has a shared common affinity for running; stories, smiles, high fives and sweat are exchanged as goals are met and dreams accomplished. Throw in matching shirts, photos, and goodie bags, and you have the makings of a jolly good time of merry running. We picked up our race packets on Saturday. The bags were filled with all sorts of goodies, like: green vitamins, deodorant, face wash, and snickers. Score! 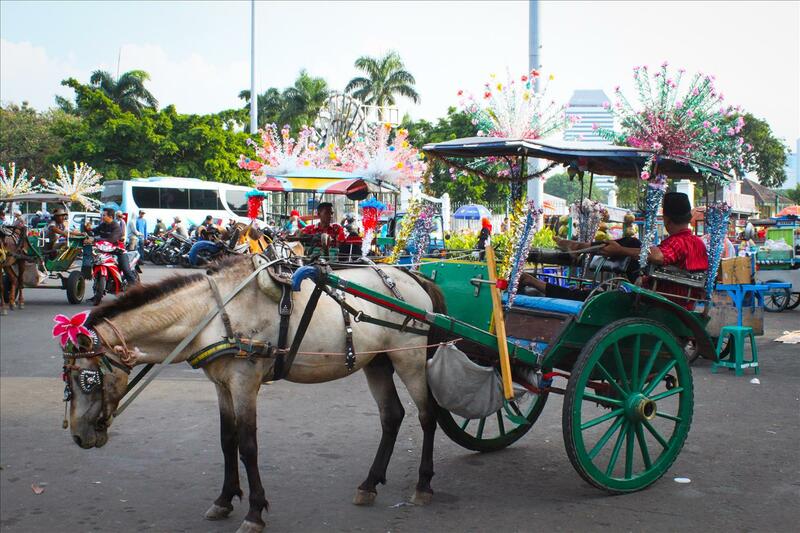 The pick-up area at the National Monument was littered with traditional food stalls, horse drawn carts, music and drinkable coconuts. Indonesian culture and decoration was not in short supply. A whole rainbow of colors greeted the eager runners. Sunday started with a 3 a.m. wake-up which I was hard to find the motivation for, but glad I did. 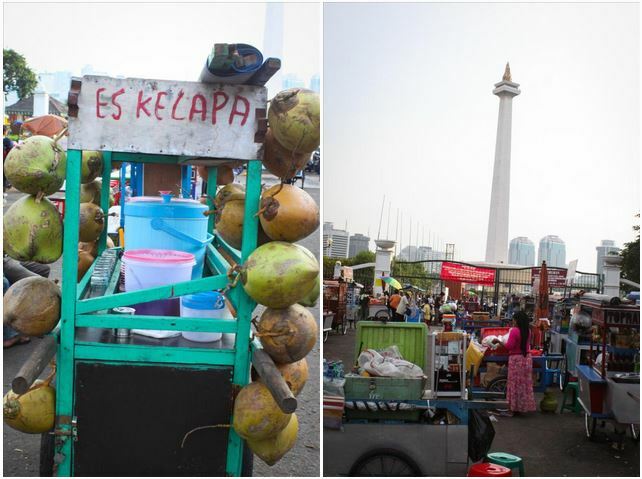 The temperature early in the morning in Jakarta was nice, and all the streets were closed – which offered a rare, traffic-free view of the urban landscape. I had never seen Jakarta without cars, and could appreciate the full view of both sides of the street and the impressive high rises. 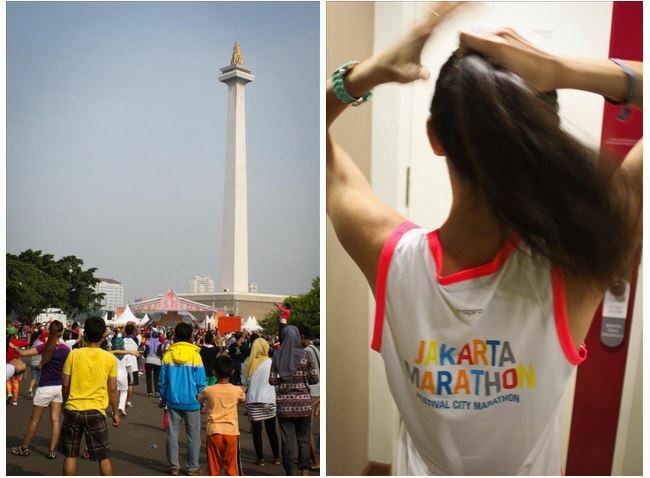 The MONAS torch stood as a beacon marking the start and finish of the race. Shane and Matt’s race started at 5am, and I hit the pavement at 5:15 a.m. 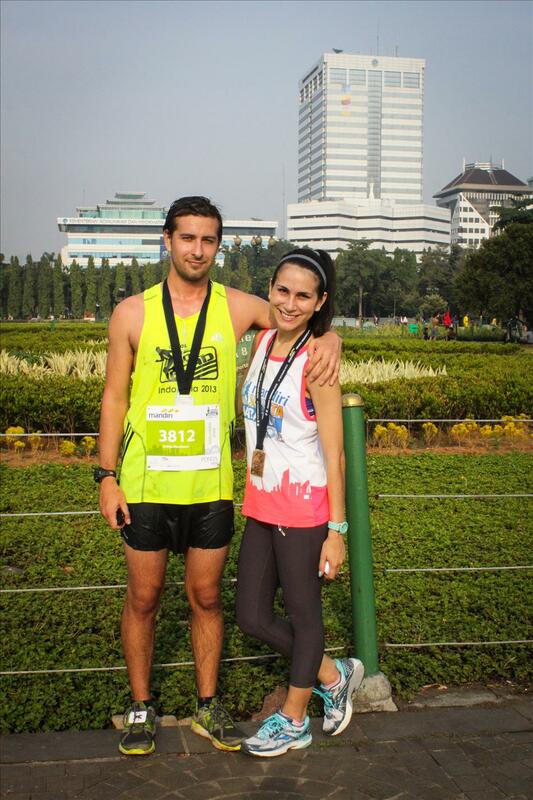 I found myself crossing the start line plugged into an energetic playlist and ready to enjoy the city-scape at a trot. In a short amount of time that seemed like a lot longer, I was dripping sweat in the humid air, eyes on the horizon line hoping to see a line labelled F-I-N-I-S-H to appear soon. I am not a competitive person, but every runner I passed gave me a rush of joy. Every time I wanted to stop and walk to tend to my side cramp, I promised myself that I would make it to that building and then take a walking break, when I reached that building, I coaxed myself a bit further from that building to the next. Somewhere around 30 minutes later the MONAS came into view beckoning me to take the last and final stretch of the road. And at minute 39:20 according to my iPod timer, my race was over. A medal hung around my neck marking me as a finisher. Post race activities included posing to commemorate the individual feats which we all had just surmounted. Shane and Matt had finished a half marathon, Amilia had just done a 10k, and I had completed my 5k. Although it was the shortest distance, I was insanely proud of myself. Meeting your goal and celebrating with all the fellow runners gives the post race atmosphere a great feeling. Endorphins are literally in the air. The runner’s racing holiday spirit is contagious. 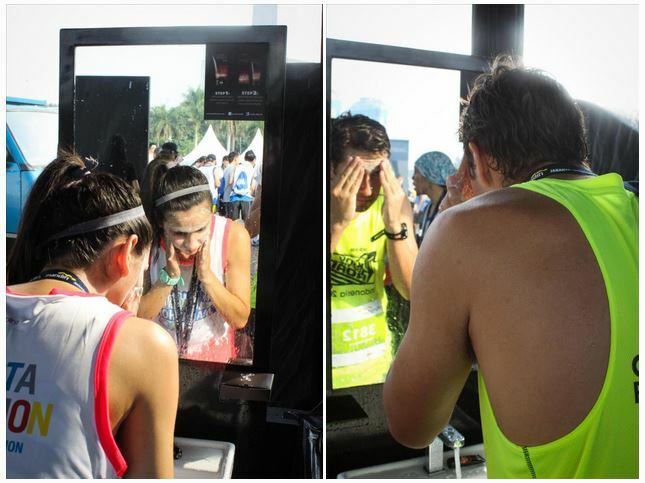 There were face wash stations sponsored by Pond’s at the post race expo area. The stations provided free samples of wash, moisturizer and towels. It was easily my favorite booth of the entire place, as it allowed me to feel like I could regain a little of my humanity; instead of feeling like a salted melting slug in the tropical air. Running at your limit is never particularly pleasant at the time, but has an addicting quality. Your legs will feel like jelly, lungs will burn, but somehow you discover this really stubborn little voice inside your head that you didn’t know was there telling you to “keep going”. And so you do. Running is something more than putting one foot in front of the other a little faster than usual; it’s more than torturing yourself a little for a medal and a new shirt. It’s also more than comparing your times with other racers or your previous self. Racing allows you to meet goals, to push yourself and achieve something. It allows you to feel the satisfaction of completing both a physical and mental feat in a community setting. Goals are achieved, high-fives exchanged and friends are made. Running feels good for the spirit. Semangat! Great write-up Andrea with your unique story-telling and perspective. Another winner!